As the preferred option for compact executive car buyers who like an engaging drive to go with their brushed aluminium and brand equity, the BMW 3 Series always looked likely to go down a storm in coupe form. With the saloon's athleticism and unerring engineering packaged within a more graceful amalgamation of body panels, it was hard to see how the coupe could fail on the occasion of its 2006 launch. Fail it didn't and as a used buy, there's no reason why a two-door version of BMW's most bountiful cash cow shouldn't be a similar success. 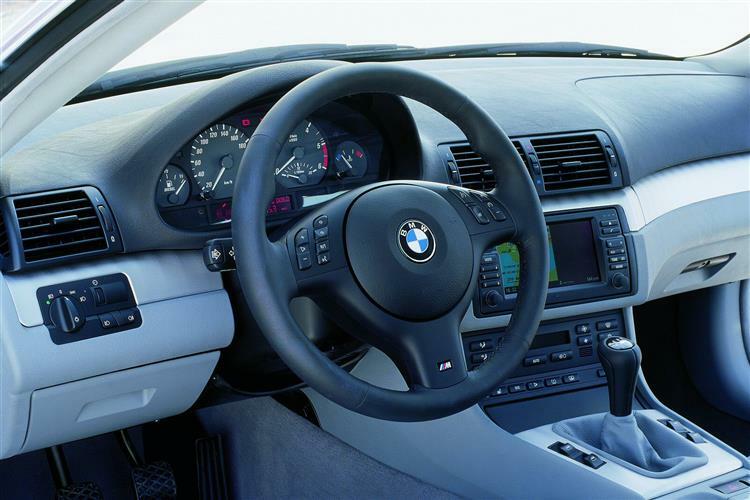 BMW had ruffled a few feathers amongst its loyal customer base with the Chris Bangle-devised styling of its 2002 7 Series and 2003 5 Series. In conservative market sectors like these, where a rough approximation of the status quo tends to be the best target for new product development programmes, the sharp creases and concave surfaces had proven too challenging for some. BMW had shown conviction that Bangle was right and that everyone would eventually come to realise his genius (what else was it to do with his workmanship filling its showrooms?) but a lot was riding E90 3 Series and it was no great surprise when it adopted a more measured approach. Stylish, well proportioned and notably non-controversial, the E90 Three was BMW back doing what it has always done best. The E92 Coupe model arrived a year after the saloon. It was the first BMW in a while with which you didn't need to hunt around for faint praise adjectives like dramatic and charismatic. This car was genuinely pretty with its sleek silhouette and clean lines. 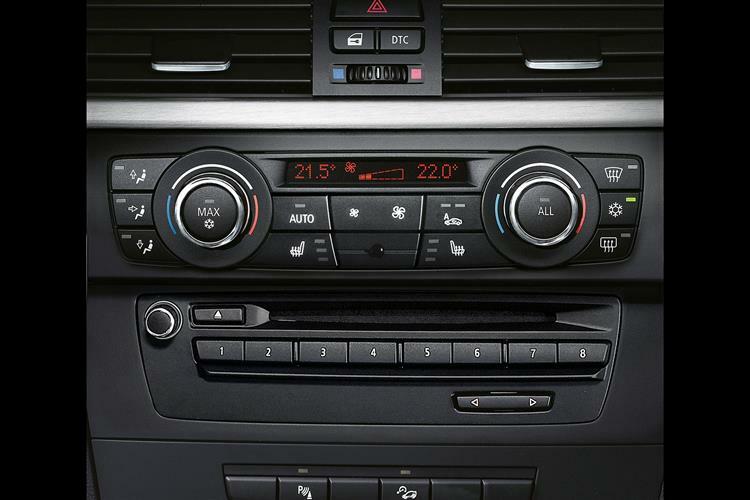 With the styling nail firmly bashed into the timber, BMW's prowess in the engineering department could shine through. The Coupe featured a truncated version of the saloon engine range with the different units arriving in stages over the six months from Autumn 2006. The more affordable small petrol and diesel engines that the 3 Series saloon tempts tax battered company car users with were not offered, so things kicked off with the 320i and 320d, both featuring 2.0-litre four-cylinder engines. From there, despite what the nomenclature might lead you to believe, all the mainstream engines were 3.0-litre six-cylinder ones. The 325i and 330i petrol cars are normally-aspirated but the 335i has twin turbochargers. The diesels are all common-rail turbo units, with the 325d and 330d using a single turbo and the 335d having two. The M3 Coupe went on sale in April 2007 packing a 420bhp V8 and more attitude than a teenager with a trust fund. In the Autumn of 2007, BMW included its EfficientDynamics package across the 3-Series range with impressive results. The technology used varies according to the engine and model but significant fuel economy savings were made to most Coupe models from the 57-plate onwards. A facelift early in 2010 brought styling upgrades designed to produce a more sporty look. LED lights were included and a single wide air-intake was introduced beneath the bumper. 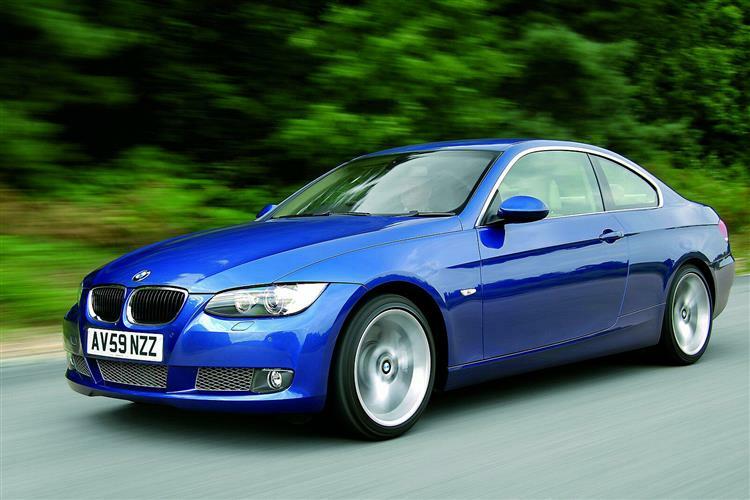 Small improvements were made to the economy and emissions of various engines and the 320d model was upgraded to 184bhp. Leather trim became standard on all models at this stage but prices took a jump too. The 3 Series Coupe rides on the same front-engined, rear-wheel-drive platform as the saloon but there are differences aside from the two missing doors. The kidney grilles at the front of the 3-Series Coupe were restyled to give a simpler, cleaner look while the headlamps have a more piercing stare. Move round to the rear and you'll pick out the broad tail light clusters that incorporate horizontal LED rods. On the way, you'll spot the sculpted flanks and should you tap the front wings, you'll find that instead of the high-pitched ring of steel, you'll hear the duller thud of plastic. In a bid to cleave weight from the 3 Series Coupe, BMW used plastic as well as the more traditional method of 'tailored blanks' - panels that are thick where structural rigidity is needed and thin where it's not. With a fixed centre console dividing the rear seats, the 3 Series Coupe is a proper four seater with room in the back for two adults. The 440-litre boot and folding rear seats add a welcome dose of practicality but this is, above all, a coupe model. All models came with close-ratio six-speed manual gearboxes as standard but there was also a very decent automatic option that halves the shift times of a conventional auto thanks to a smart interface between software and torque converter. There is even a pair of paddle shifts behind the wheel for when the driver wants to have some fun. That three letter word figures large in the 3 Series vocabulary. One look at the aluminium suspension parts and the direct rack and pinion steering shows that BMW was serious about upholding its reputation for producing the Ultimate Driving Machine. No major faults have been reported with this generation 3 Series, BMW learning their lessons from the old car's problems with sub-par South African cars and lingering Nikasil cylinder lining grumbles. Always go for metallic colours. Be suspicious of cars that have had many owners in a short time (this could be a sign of ongoing problems). If you really want peace of mind, buy from a BMW dealer - but be prepared to pay the premium. (approx based on a 2006 320i Coupe) A clutch assembly is around £150. Front brake pads are around £60, a full exhaust about £500, an alternator around £150 and a tyre around £90. A starter motor is about £170. The 3-Series coupe's focus on shaving weight comes hand in hand with some seriously powerful engines and that will be enough to pique the interest of any keen driver. The petrol line-up starts with the 320i, then comes the 218bhp 325i model, which sits just below the 272bhp 330i derivative. At the top of the pile sits the legendary M3 but another version that gets everybody in the know excited is the 306bhp 335i. This was BMW's first turbocharged petrol unit offered in this country since the 2002 turbo, a car that was pensioned off in 1975. That leaves the diesels. These start with the 320d, then come the 325d and the 330d. The diesel flagship is the 286bhp 335d. Accelerating from zero to 60mph in just 5.5 seconds, the 335i is a car that's almost as fast as the previous generation M3 yet which is far less temperamental. As is the norm with high-end BMW models, the top speed is electronically limited to 155mph. Ignore the badge on the back, this is no 3.5-litre unit. Instead it's a twin-turbocharged 3.0-litre powerplant, each blower supplying compressed air to three cylinders each. Using smaller turbos helps to overcome the inertia of one big unit. In turn, this lack of turbo lag helps this forced induction engine to replicate the progressive power output of a big, normally-aspirated powerplant. Mind you, even the 325i petrol model is no sluggard, punting the Coupe to 60mph in 6.6 seconds and on to 155mph. 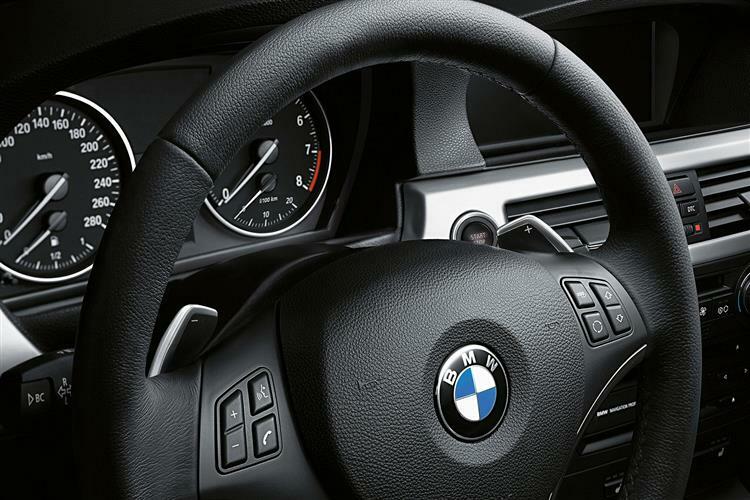 The 3 Series Coupe is a wonderfully involving thing to drive, talented and communicative in the extreme. It steers, goes and stops with real athleticism regardless of the engines installed but it's only the really powerful units that let you get the most from the chassis. The ride is on the firm side and that is the one area where people regularly find fault with the car. It's not harsh but it's a sporty set-up in keeping with the character of the 3-Series and there are those who prefer more of a cushy ride. It's also worth noting the fuel economy that's obtainable from this highly capable sports coupe. BMW introduced its EfficientDynamics technology shortly after launch, so 57-plate cars and later gain a useful boost in economy of between 3 and 5 miles per gallon. The diesels shine particularly brightly with the 320d returning an outstanding 59mpg and 128g/km emissions. Even the 335d can still manage 42mpg and 177g/km, while the petrol options are hardly profligate either. The 44.8mpg 320i has 151g/km emissions and the 335i can return 31mpg with 218g/km emissions. The BMW 3 Series Coupe offers four-seat practicality and a sparkling driving experience powered by a fine range of engines. The set-up might be a little too focused for some tastes, particularly in the firmly suspended M Sport models, but keen drivers will love the accurate steering, handling balance and performance. The engines also turn in first class economy figures completing a sensibly sporting package.